We took a quick video of the Verrazzano bag, to answer some questions we’ve been getting about how the strap and the closure work. Hope this helps! Today I was reading up on some tips and tricks for increasing inbound links to our site. I came across a good article (I have to go back and find the site, I will repost the link when I do), and one of the many tips talked about getting listed on Technorati. I knew of Technorati but could not say that I was intimately familiar with how it works. After digging around a bit, I found that in order to get listed in their blog directory, you have to first “claim” the blog … fair enough. Wouldn’t want another entity posing as us now, would we?? To claim a blog, you have to first create a technorati account. Turns out Daniele already had one, but I went ahead and created a new one – a quick and painless process. Then you enter some info about your blog, submit it, and wait for something to happen magically … or so I thought. Actually, you have to go back to your profile page and click on the “Check Claim” button to continue the submission process. When you click on the button, you are given a short code that is to be posted to the blog for verification. This part was not clearly explained in the previous step (either that or I just completely missed it), so good thing I decided to poke around a bit instead of just sitting back and waiting. This is what I was talking about. 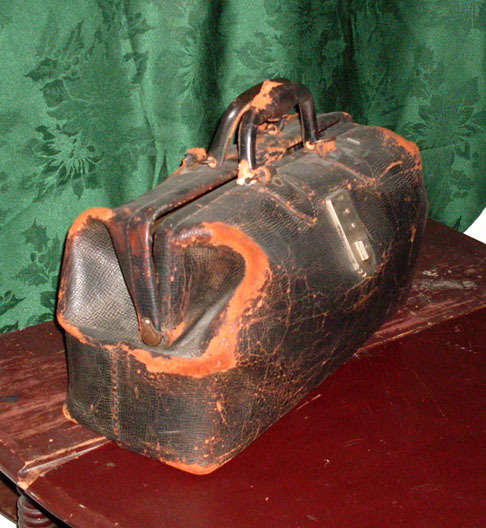 A real, leather doctor's bag. This one’s actually a prop that you can rent from a company called All About Props. It looks like something you’d see being used by an old, white-haired doctor with spectacles in a black and white film. As I was researching leather doctor bags, however, I noticed that the term “doctor bag” is being used quite liberally these days. Haute designers such as Prada and Versace have designed handbags for women that really have nothing to do with the traditional doctor bags, and are calling them doctor bags. I suppose that has the benefit of sounding sophisticated, if more than a bit misleading. Doctor bags by Prada. What would you think if your doc showed up with a bag like this? Versace. Yes, it is a bag and does have handles. I guess that qualifies it as a doctor bag. Well, after sifting through hundreds of so-called doctor bags, I came to the realization that if I were looking for a real, vintage-looking, awe-inspiring doctor bag, the pickings are slim to none. Enter the doctor bag by Campomaggi – I would love to talk about how beautiful it is, but instead I think I will just let the bag speak for itself. And it will. We had a lot of fun at the Festa Coloniale Italiana in San Francisco this past weekend. It was our first time participating in an event like this, and other than the hairy moment we had when the wind just about blew our tent away, we had a fantastic time meeting and chatting with fellow lovers of fine handmade Italian goods. Giann's elephant keychain was simply irresistible! The runaway winner of the festa was Giann’s Elefante Italian leather elephant keychain – it was sold out by mid-day and people just could not help but comment on how cute it is! But then again, the entire keychain rack seemed to elicit incessant cries of “ooh”s and “ahh”s throughout the day! Another product that got a lot of attention was Campomaggi’s distressed doctor bag. People seemed to be drawn but it, and many were gawking at this bag, seemingly transfixed in some altered state of mind. We just got these bags in so I don’t even have a photo to post yet … but for now, you’ll just have to take my word for it. It’s drool-worthy. Anyway, thanks to all those who stopped by our booth, and we hope to see you again at the next event (TBD)!! Our new Campomaggi Forum is now live! We are excited to announce that due to popular demand, we have launched a Campomaggi forum! Here, Campomaggi bag owners, fans, and admirers can discuss the brand from different points of view – philosophical, practical, theoretical, and more. I have loved leather bags my entire life. So it is no surprise that after we founded Marcopoloni in 2003, we started looking for a high-quality, handmade line of bags and we introduced our first leather bag back in 2005. The FRECCIA iPad Bag, which I want to use with my new Samsung Galaxy 10.1. I would like to add more, but for now I would be very content with these. Today it is my birthday, so I feel like dreaming a little. We just posted two new Caterina Lucchi leather handbags and we are so excited about them both! SERA Convertible Clutch Handbag ... chic, playful, and oh so versatile! The Petalo is a small, light handbag, and it feels oh so good in the hand. The laser-cut flower-motif design is stunning in its own right, but add to it the uniquely-dyed pattern and you’ve got an amazing little bag that packs a big punch! PETALO Laser-cut Flower-Motif Handbag ... small, but packs a punch! Both bags are made with Caterina Lucchi’s signature garment-dyed process, resulting in calfskin so soft you will find them very hard to put down! Last week we added one of my favorite products: the EURO Leather Coin Wallet. This coin purse is designed in the style that Italians call “Tacco”. It features a hard heeled edge that prevents coins from easily falling out and it is crafted using top quality Italian full-grain leather–the kind of leather whose price is going through the roof this year. The craftsmanship and quality of materials make this leather coin wallet really stand out and one of the best values around.